In the winter it’s essential to keep children’s skin moisturized. Last week we explained the dangers of dry air and why using a cool-mist humidifier in the room where the child sleeps can help keep their nasal passages moist. Another common problem caused by dry winter air is eczema. The skin of a child with eczema reacts abnormally and easily to irritants, food, and environmental allergens and becomes red, flaky and very itchy. It also becomes vulnerable to surface infections caused by bacteria. In infants, the condition causes red, scaly, oozy, and crusty cheeks and the symptoms commonly appear on their legs, neck, and arms. To combat the severe dryness associated with eczema, a high-quality, dermatologist-approved moisturizer should be used daily. Moisturizers should not have any ingredients that may further aggravate the condition. Moisturizers are especially effective if applied five to ten minutes after bathing. As a rule of thumb the thicker the moisturizer the better it is at retaining moisture. Petroleum jelly is considered one of the most effective moisturizers by reducing water loss by up to 98%. Soap and water are drying to a baby’s and child’s skin, so be careful not to overdo the baths in the winter months. You can bathe babies only every two or three days and just wash hands, face, and diaper area most days. Try cool or room temperature water, it’s less drying than hot water. And if the parents want you to bath the children daily just make sure all the kids in the household take quick baths and showers in the winter so their skin doesn’t lose to much moisture. Our next tip is to avoid any soap or lotion that contains perfume or dye. Use a mild soap, or non-soap cleanser, and warm, not hot, water. Sun also irritates sensitive skin so put on sunscreen if going outside, (yes, even in the winter). Many lotions and creams are made especially for babies’ sensitive skin. This upcoming week we will review the best lotions for children to prevent dry, chapped skin. You can even carry a moisturizing stick that tucks into your diaper bag. It’s very important to not allow little ones get chilled after a bath. So, don’t forget to wrap babies in a hooded baby towel as soon as you take them out of the water and pat (don’t rub) them dry him quickly. Put a mild baby lotion on their skin, and then bundle them up. 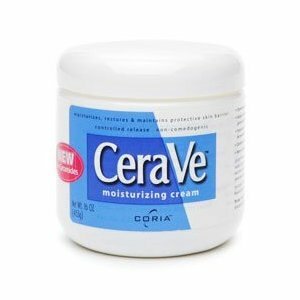 Our first product we love for treating eczema is CeraVe Moisturizing Cream . I first heard of it when my charge’s dermatologist recommend it. This moisturizer is great for dry skin in generally, but it’s perfect for sensitive skin, psoriasis, and many other skin conditions. CeraVe Moisturizing Cream is so gentle that pediatricians often recommend it for eczema in babies and children. CeraVe™ Moisturizing Cream provides all-day moisture with a single application and is clinically proven to increase skin hydration. But, I still rub in a little whenever changing a diaper or whenever changing the older kids’ clothing. It contains ceramides, naturally occurring components of the skin that play a key role in enhancing and restoring the skin’s protective function. Also included are vital humectants and emollients to replenish and retain needed moisture. The unique ingredients in CeraVe™ Moisturizing Cream help restore damaged skin and keep skin healthy. With its patented Multivesicular Emulsion (MVE) formulation, CeraVe™ Moisturizing Cream helps restore and maintain the skin’s natural protective function. MVE works by trapping ingredients within multi-layered vesicles that are slowly released, layer by layer throughout the day, penetrating deep into the skin to moisturize and nourish. CeraVe™ Moisturizing Cream spreads easily and absorbs quickly. It is non-greasy, non-comedogenic, and non-irritating. Have you tried CeraVe? What do you think? Yes I've used this cream on kids and it's great. I also rub it into my skin after putting on kids, it's great stuff. Every year my fingers bleed from dryness this time of year and they are better this year and I really think due to this cream. I really love this product too! I used it now for myselg too. For the baby I nanny for, after using the product for about two weeks, we started to notice a significant difference in her eczema rash. She hasn't had any major ezcema flair ups since using this cream. It's been great for my skin too and the baby's so I recommend it. I have been using the CeraVe lotion, but my dermatologist recommended I use the CeraVe cream for winter. I have very sensitive skin and my eczema has been exceptionally bad lately. This cream has been great. Even in these cold dry winter days I have not had my usual winter dry skin with itchiness. I love the CeraVe products and even though it is not cheap it lasts a long time and works better than any other cheaper products. I was hesitant to use a cream since I HATE greasy or thick feeling moisturizers but this goes on smoothly and soaks in fast, yet provides a thicker moisturizer than lotion. Highly recommend it! I tried every lotion and cream for sensitive skin and this one was recommended by my charge's dermatologist. It is super. It has no fragrance & is great for sensitive skin. Creams are better than lotions (says the dermatologist) and I have to agree. It's very thick and creamy but there is absolutely no greasy feel with this cream. I highly recommend it!